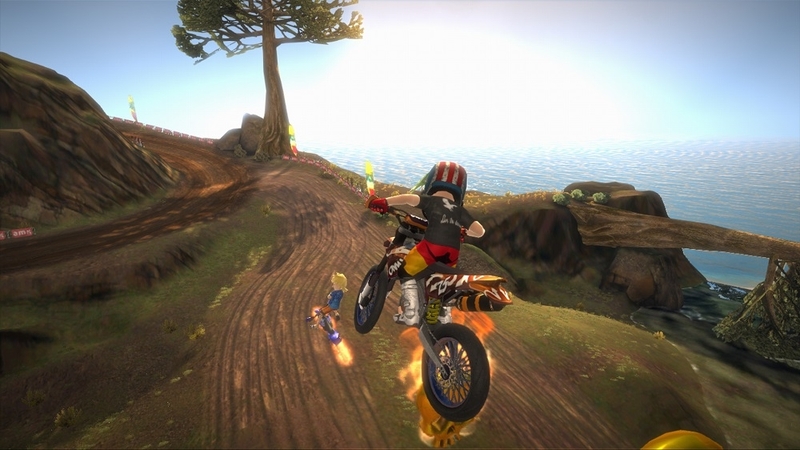 The all new Motocross Madness is an arcade racer, developed by Bongfish (responsible for the snowboarding title Stoked), and is available exclusively on the Xbox Live Marketplace. It has a number of different modes, the majority of which can be played in both single and multiplayer. These are Races, Rivals, Trick Sessions and Exploration. The first of those, Races, is pretty self explanatory. Race against AI opponents to win the race, bagging yourself a handful of cash and some XP. The XP builds up, and you level up. Each time you level, you unlock a new ability which gives you the edge over your opponents. These can give you more speed for your boost, longer multipliers and unlock new tricks. The cash can be used for new bikes, upgrades for the bikes that you do own, and avatar clothes. The clothes are purely aesthetic, but they are for the most part very cool. The fire proximity suit in particular looks awesome, and shows off the graphical capabilities of the title. There is a good selection of bikes to choose from, each more suited to a certain task than the others. Some may have great speed, but handle terrible, whereas some may be good for tricks, but have low acceleration. Even though there are a variety of bike styles to choose from, it's quite easy to use one bike for all the different events and terrains. The Rivals mode is basically a time trial, against ghost racers. You must complete one lap as fast as possible, utilising all of the shortcuts and boosts available to you. The main different between Races and Rivals is that the Race mode requires you to complete three laps, not just one. You also lose the ability to punch and kick the other riders, which can often gain you a valuable second or two. Trick Sessions are set in sections of the open world levels, and in these you must complete various stunts and tricks to rack up the biggest score as possible to grab the gold. To help with the task, you can find boosts, score multipliers and extra time. This mode is a lot of fun, and really allows you to go wild with the trick system. The tricks are divided into three tiers of difficulty; easy tricks use X, medium tricks use Y and the most difficult tricks, which are only available once you have saved enough boost, are pulled off with the B button. The B tricks in particular are incredibly acrobatic, a lot of fun to watch and even more satisfying to land. Finally, there are the Exploration levels. These let you roam around the three different environments (Egypt, Australia, Iceland) to do whatever you like. There are coins and skulls to collect, and finding all of these can take a long time. The skulls are the only ones needed for a gold medal, but the coins give you more cash to buy things. Of all the modes, this is the one where the game's issues cause the most problems. The physics can cause many issues when trying to collect the more tricky coins and skulls, whether you need to traverse a narrow platform or hit a jump just right. The bike handling is very slippy, which isn't a problem at high speeds, but when trying to line up a perfect jump can really cause some grief. It doesn't help that the when you crash, you respawn in a seemingly random place in the surrounding area, meaning you have to painstakingly line up again for the next try. It doesn't happen like this all of the time, but 80% of the time you will not be happy with the respawn location. 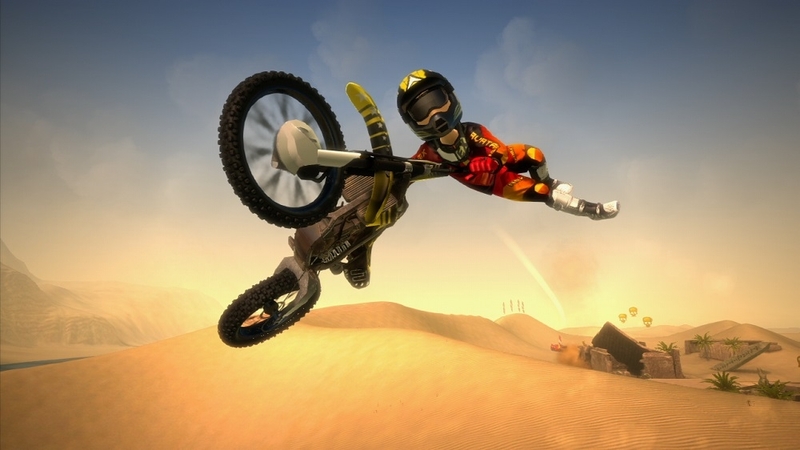 Playing online is the best way to experience Motocross Madness. Playing with a friend on any of the modes just adds to the satisfaction of winning, and the intensity of the races is much higher when there is a real opponent piling on the pressure. The collectibles from the Exploration mode are unfortunately not available when playing Exploration online, which is a shame. Hunting for skulls with a friend would greatly increase the levels of enjoyment, and the world would feel much more alive than it does when flying solo. Graphically, Motocross Madness is very impressive. The open world levels are all very distinctive and look great, with realistic terrain, whether that be sand, mud or ice, and great attention to detail in the buildings and structures across the different worlds. They can feel a little empty at times, when the most activity happens to be a boat, following a simple path at unrealistic speeds. Whilst it does look odd, it is somehow comforting to see other movement in the levels. Overall, Motocross Madness is a fun game, which is worth buying if you have a couple friends also willing to buy it. The multiplayer modes are definitely the best aspect of the game, and will provide many more hours of fun than the single player alone. There are some issues which can greatly reduce your overall experience, but with a fix already awaiting approval, these may soon be a thing of the past. Definitely download the trial version of the game. Chances are you'll like it, and with a low price of 800MSP, it is great value for money. Just be prepared for the glitches and physics issues, and maybe keep a spare controller handy, for when the rage gets the better of you. How do you punch another player?